What many of you won't know is that I have a small business selling mid-century pottery. I love finding old and vintage items in order to give them a new lease of life with an appreciative owner. 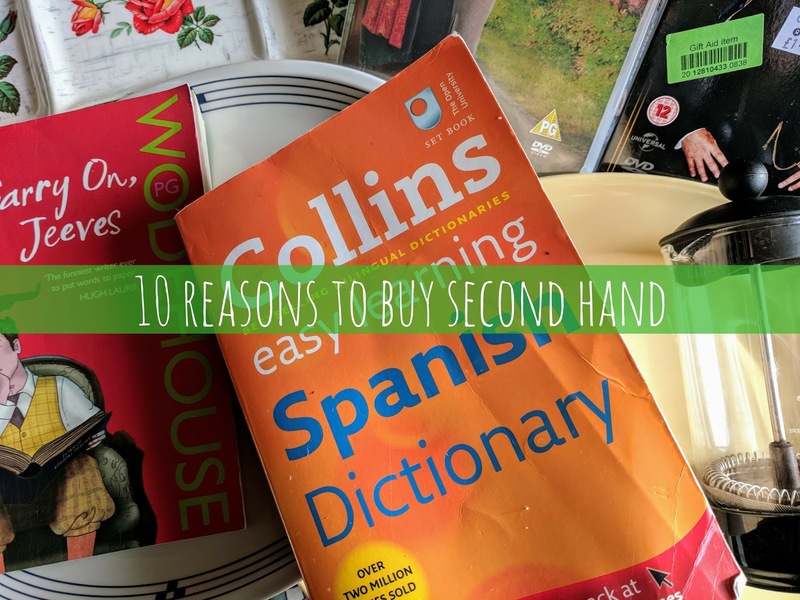 Many people sniff at buying anything second hand but I will argue that there are plenty of reasons to ditch the new and bring the second hand into your life. 1. Support small businesses – Forget big companies who don't pay their fair share of taxes. If you buy from a second hand shop or dealer you are probably helping an individual or family run business. 2. Helps charity – Most second hand shops come in the form of charity shops. Giving to charity constantly isn't something that many of us can manage to do. If you start swapping your new purchases for charity ones then you help out without feeling the pinch. 3. Discourages throwaway culture – So many things these days are barely used before they are discarded. By having outlets to donate or sell unwanted goods it means people are less likely to just bin them. 4. Encourages patience – We now live in a society where we can buy what we want and have it now. When something is so easy to get hold there can be very little pleasure or joy in such purchases. Last year the glass beaker in Mr JibberJabber's cafetière cracked. I tried getting it out so I could try and get a replacement but it wasn't budging. Rather than rushing out I waited until I found one in a charity shop. Soon a Bodum one turned up and it cost just £1. 5. The thrill of the chase – If you are after something special there's a particular delight in tracking it down. Whether you get up early for a car boot sale, trawl through online listings or go round the shops you won't want to stop until you found it. 6. Cheaper – Whether you buy clothes, DVDs, CDs or books you can save so much money if you get them second hand. Miss JibberJabber has started Spanish at school and we saw a very good dictionary in a bookshop priced at £8.99. A look round a couple of charity shops and I found the same for just 75p. 7. Be unique – When I go down to the local shopping centre I see the same clothes worn over and over again. That's the trouble with buying what is new in the shops at the moment. Create your own style and stand out in a crowd. 8. New discoveries – By browsing the eclectic selection of items in second hand shops you never know what will catch your eye. A book you didn't know about or a DVD of a film you've never seen. 9. Better quality – I sell pottery items that are 40 to 60 years old. They have been used and loved and yet still have years of use left in them. Years ago pottery companies had the same designs in production for years so customers could add pieces over time. If they broke or chipped easily customers wouldn't have added to their collections. 10. It isn't unhygienic – Time and again I hear the argument that second hand goods are unhygienic. Have you ever stayed in a hotel and slept on bed that has been used by thousands of other people? Do you eat in cafés or restaurants and use their glasses, crockery and cutlery? Of course you have done. We all have access to modern cleaning materials so when we get home we can get things cleaned to our own satisfaction. Do you like to buy second hand item? Where are your favourites to source goods? Lovely post. I love charity shops and find amazing things in them saving me loads of money. I absolutely adore buying second hand. In France, boot fairs and brocantes (antique/second-hand shops) are very popular and found in all towns although charity shops are rare so I have to wait to my UK trip to catch up shopping in those! I also love Facebook buy and sell groups and the French website LeBonCoin (the good corner) where you can pick up almost anything second-hand you want locally. I do find the idea that people think second-hand in unhygienic very sad and worrying and your reply to those people is spot on. A brilliant post and thank you for adding it to #GoingGreen. Hope you can join in the next one when it opens on March 5th.